Bryant never said exactly what it was he had in mind, which is one reason Doug Barfield thinks it might have just been an attempt at some sort of houndstooth head game—not with him, but with Auburn. Sure, they’d just fired him and turned his name into a byword, but having their former coach immediately join the dark side surely would have have ticked off the stepchildren across the state. Or maybe he really thought he had some talent. They’d written a song about his offense for crying out loud, and ol’ Bear had a reputation for signing recruits not really to use them, but just so others couldn’t use them. That’s what you hear at least. Maybe it was something like that—taking him off the market. Or maybe it would have just been something like a favor, kind of like what it seemed Bryant had done for Paul Davis. 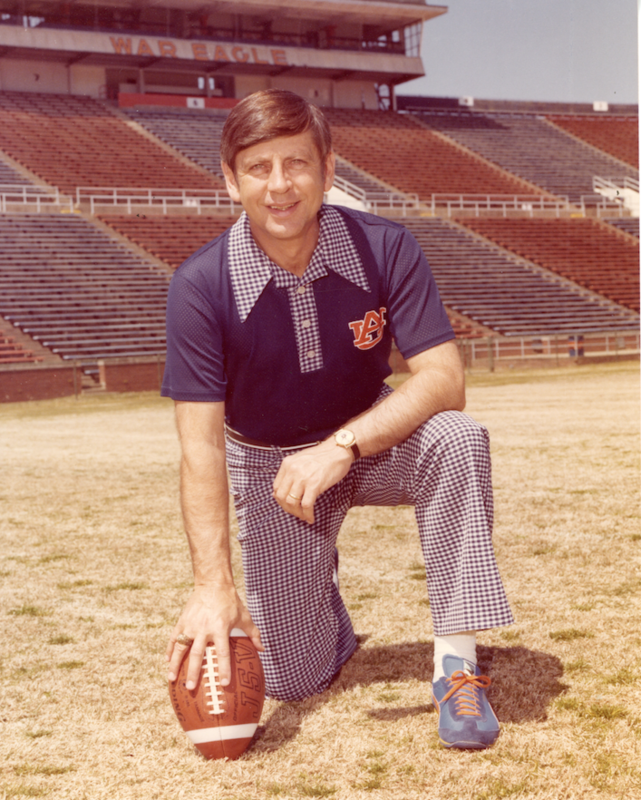 Most everyone had assumed Davis, Auburn’s defensive coordinator from ’67-’75, was Shug’s heir apparently. He had the look, the experience; he’d been head coach at Mississippi State 10 years earlier. When Barfield got the nod, he replaced Davis with this guy and moved him down to offensive backfield coach. When Barfield got the axe, Davis was going to hang it up. But Bryant called. “Off-campus recruitment coordinator for the University of Alabama” meant he wouldn’t have to go into insurance, meant he could keep building his state retirement. He said yes. Barfield told me he almost did, too. Or at least probably would have had the question—the right question—been put to him. Here’s part of my interview with him last summer. I’m turning it into a series. It was at Panera Bread in Auburn. My car died in the parking lot. He still has family here. He’s a good man. Today is his 82nd birthday. Happy Birthday, Coach! Party like it’s 1977! Was going up against Bear Bryant intimidating? What was his opinion of you? Bear Bryant apparently pondered it, too. How soon after you were fired was this? Please consider helping TWER keep on keepin’ on. It’s easy. I was Sports Editor on the Plainsman in 1979????? Toward the end of Barfield’s tenure, we had a visit from Woody Hayes, who had been fired at Ohio State (sometime in early 1979???). 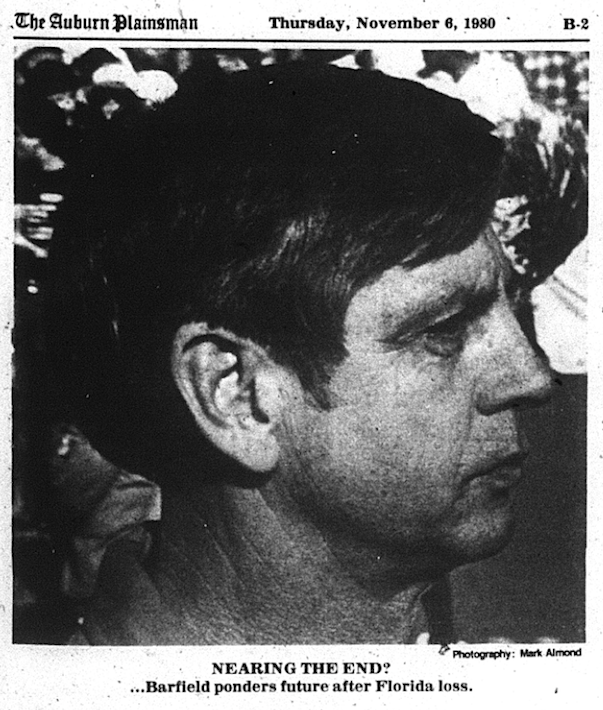 Lee Hayley (then Athletic Director), claimed that he was in Auburn to speak to some high school coaches. I have a feeling they were considering hiring Woody to replace Barfield. I wonder who could substantiate this?? By the way, I listen to you guys on the radio every day up here in Fort Wayne. Thanks for the comment, Barry — and for listening! I’ve seen that Hayes story. Thought it was an odd choice — a coach just fired for punching a player speaking to high school coaches about leadership or whatever. I’m sure there had to be some sort of discussion along those lines, at least at some level.